The Windowpane Series from Mother Earth Brewing focuses on brewing with non-traditional brewing ingredients sourced from North Carolina. 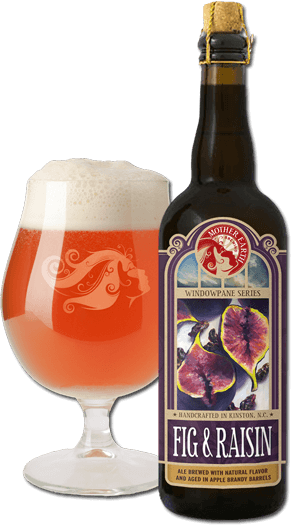 Windowpane Series: Fig & Raisin is a Belgian-Style Dubbel beer fermented with figs and raisins, then aged in apple brandy barrels for three months. Anticipate a prevailing aroma of dark fruit, blended with vanilla and oak to greet you. "Fig & Raisin is one of those beers that I get great satisfaction from just smelling, but obviously then drinking. Expect huge dark fruit aroma and taste along with a mellow hit of brandy and wood."